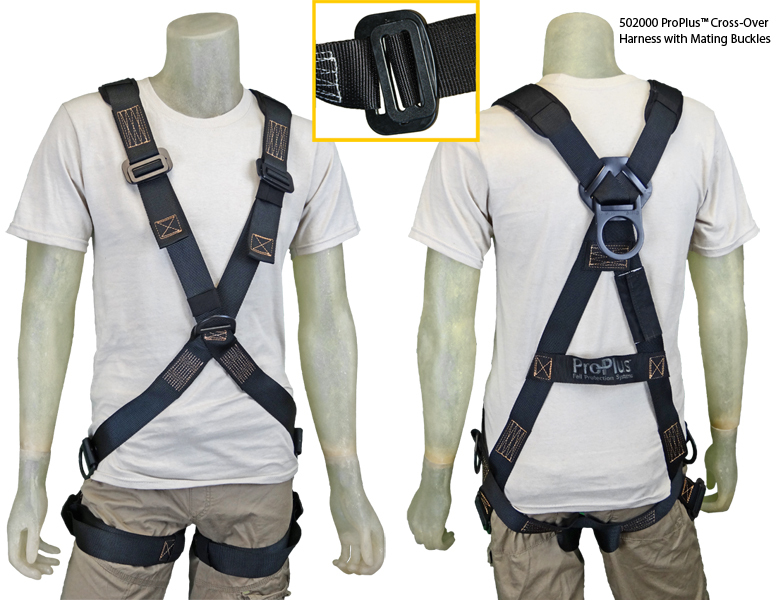 The ProPlus Cross-Over harness is a general purpose, full body harness designed to meet the needs of entertainment technicians working at height. It is comfortable and easy to adjust, making it ideal for multiple user situations. Cross over style front and back. Bayonet, Mating, or Grommet & Tongue buckle connectors. Per OSHA requirements (1910.66 App C), only one snap hook or other connector can be attached to a fall arrest ring (e.g. Dorsal Ring) at any one time. The optional additional dorsal D-ring with extension is designed for those who must transfer from one fall arrest system to another. Optional Shoulder Pads with D Rings. The optional should pads with D-rings are designed only for rescue. They should not be used for Fall Arrest or work positioning. Optional Additional Leg Padding for added comfort.